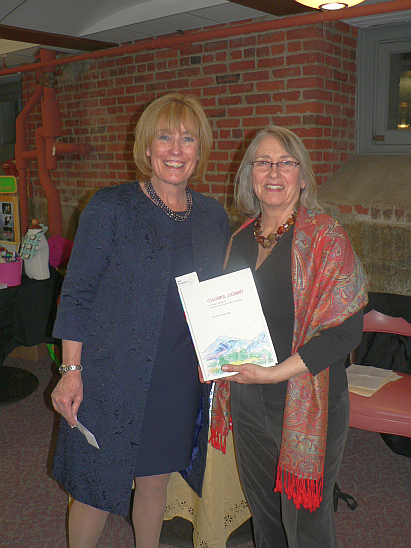 The governor of New Hampshire, Maggie Hassan, graciously posed with me and a copy of my book Colorful Journey. A group I belong to called NH-MADE was invited to be a part of her inaugural reception at the State House on January 8. 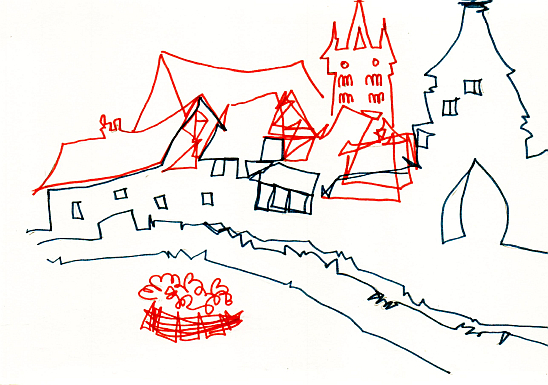 And now by special request, more drawings of France, done in the fall of 2014. 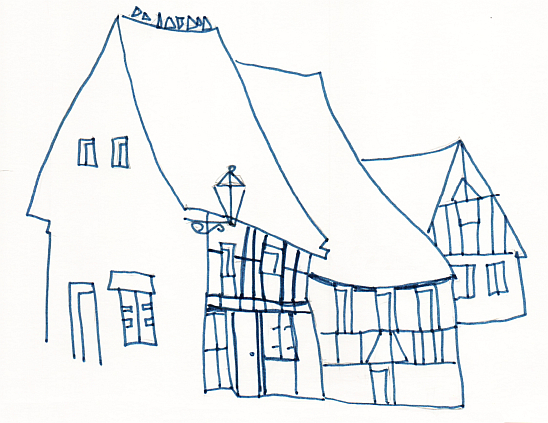 I did a couple of line drawings of the village of Châtenois in Alsace. This one was drawn very quickly, but accurately. Well, the pigeons on the roof might be abstracted a bit. 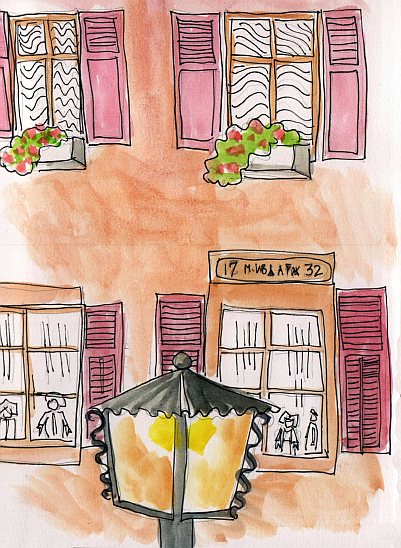 This is my second quick drawing in Châtenois, slightly less accurate, with colored marker. The black lines on top of the black tower indicate a stork’s nest. We didn’t see any storks while we were there because they migrate during the fall. They are a famous symbol of Alsace, available in souvenir shops all over the place. It is always a liberating experience to do some drawings in very free style after a few very close studies. I am not overly fond of this drawing, but I include it because it brings back pleasant memories, and that is a huge reason to draw on location. And while traveling. I didn’t notice the dolls in the window until I started drawing. Another reason to draw. The numbers above the window indicate (probably) the date the house was built, 1734, and the tools used by the occupants in their trade. Sort of an advertisement of skills. Two sets of initials are carved into the stone as well. 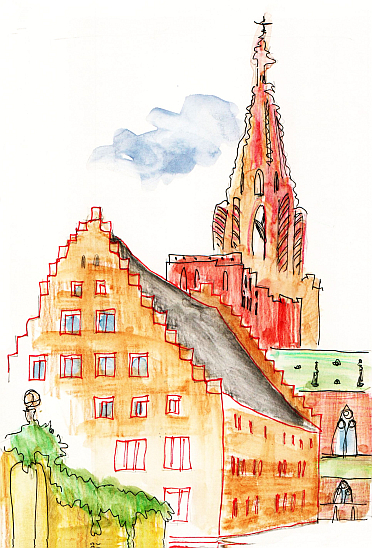 We traveled up to the major city of Strasbourg twice while we were in Alsace. We were about two blocks away from the cathedral when we turned the corner and caught this glimpse of the imposing reddish stone tower. The spire is 472 feet or 144 meters high and dominates the skyline. It is a single spire, not positioned in the center of the facade. For four centuries it was the tallest tower on a Christian church. The building in the foreground has a wonderful roof line. 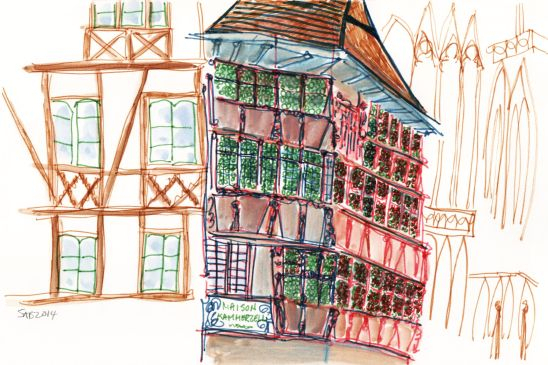 In Strasbourg, next to the cathedral, sits this wonderful very old house called the Maison Kammerzell, first constructed in 1427 and modified in 1467 and 1589. The little green circles are bulls eye glass pieces that make up the windows. Built as a private residence, it now houses a restaurant. I just looked at their website.....choucroute (sauerkraut) with three kinds of fish instead of the usual five kinds of meat. I would like to try that. I chose to sketch this because of its complex and ornate features. I knew I could get happily lost in the details. While I was drawing, a guy was speaking to me, in German, trying to sell me a children’s wind up toy. 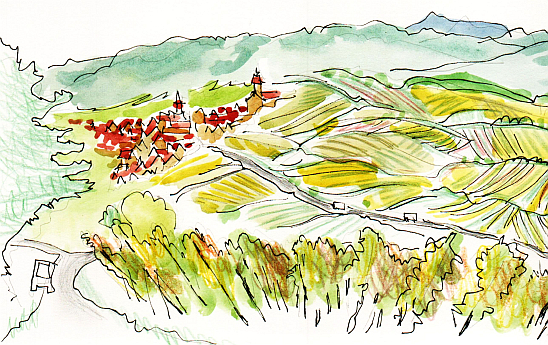 This is another view of the Route Des Vins in Alsace. In the distance is the village of Riquewihr. You see the edge of the Vosges Mountains in the background. 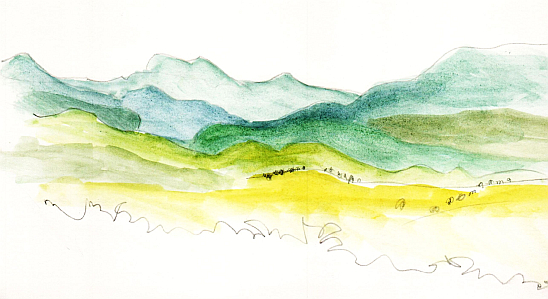 I read that the mountains are rainy and damp, and that this effect, a rain shadow, allows the valley to be dry and sunny and perfect for growing grapes. In the foreground, the end rows of the vines are within a few feet of me. I drew two tour buses on the road down below. Les Vosges Mountains lie to the west of the broad valley of the Rhine. They are very green and some of them are called ballons in French. Or, the quite obvious translation of balloons or round shapes in English. The yellow fields are the ripe grape vineyards. 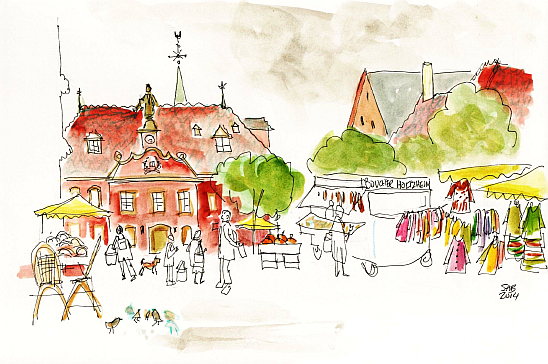 Our village of Bergheim had a small market day. The very ornate building in the rear is the town hall. This is the view from the main hang around space in our house, the living room-dining room. Here is the scene of our ridge on New Year’s Eve, just as the sun was dipping in the west. Here, we see the colors of sunset even looking east. 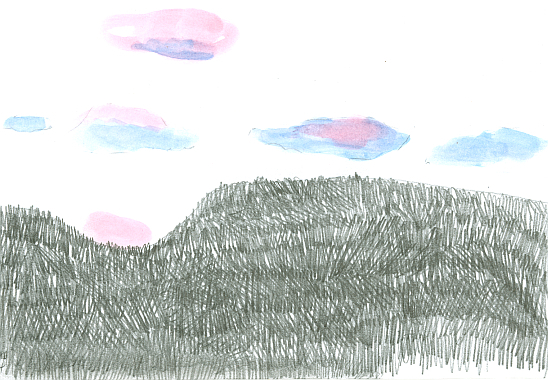 The clouds hovered like very colorful space ships. Is there anything better than a surprise box of homemade chocolates? 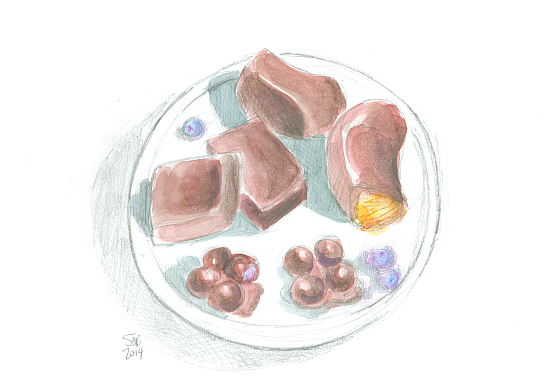 The fresh fruit depicted, enrobed in dark, smooth, delicious chocolate, is mandarin orange and blueberries. How do you get blueberries to line up so neatly into groups of four? It is that time of year. The time to look for bright colors on grey days. 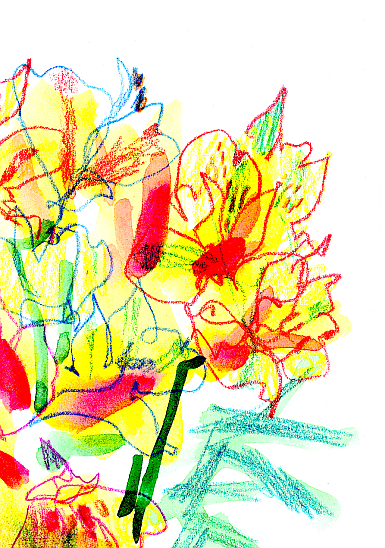 This is a cropped version of a watercolor and colored pencil sketch of alstromeria, sometimes called Peruvian lily.